Subtitled "The Story of Britain's ultimate steam locomotives", Andrew seems intent of raising the hackles of steam engine enthusiasts around the country. Plenty of GWR and LNER fans will consider the book little more than kindling for even suggesting a Castle or A4 isn't the greatest steam-powered machine in the world. This is a pity as they will miss out on a very enjoyable read. To be fair, the dyed-in-the-wool enthusiast who has his opinions fixed in stone probably wouldn't get much from this book, but those of us who don't know the history of every single bolt on every single loco and more importantly don't care, will. The author sets his stall out early. This is not a deeply technical book. As he says, that's been done many times before. The history of the locos focuses as much on the people involved as it does on the nuts'n'bolts. There are a lot of people too - designers, builders, drivers, firemen, Billy Butlin, restorers, rescuers - the list goes on. I read the book in two sittings, both of which were on trains to and from London. The text zips along at a descent pace, something unusual in fact-filled non-fiction. All in, I reckon it took about 3.5 hours, although I am a fast reader especially when there is nothing else,save some cake, to distract me. Nicely divided into 29 sensible chapters, the big surprise was that the end of steam occurs about the same point as the selection of photographs, half way through the book. 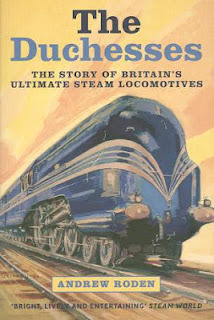 I wondered a little exactly what could be left to say but it turns out that this isn't just a history of the Duchess engines in railway service, but a full history pretty much right up until the present day. I like this but again, suspect it will be a shock for those who think the world ended in 1968. For the Duchesses, they might have retired but there were plenty more twists and turns in the story to come. How we ended up with three examples still extant is fully covered and it's a fascinating read. Most people will know that a couple of engines ended up stuffed and mounted in Butlins Holiday camps but their route from there via Bressingham to the main line is interesting. Even this isn't the end as while City of Birmingham might well be ensconced in a museum, the other have been out and about up too all sorts of things. I'll admit I knew very little about these engines before opening the book. Now I feel I know quite a lot which is a good thing. If you want a very readable, non-technical history of an important class of steam locomotive, then this is an excellent read. If you just enjoy a good story, well told, then it's worth a go as well. Boat won't go backward !